Food Memories: 61. Mile High Lasagna Pie - Mama Mia! New cookbooks are like gateways to adventure...almost anything food-related is possible to discover. I recently inherited a highly illustrated collection of recipes. I could hardly wait to see what treasures I would uncover. As I read the ingredients for the various concoctions...my enthusiasm dialed down as I found that there was a certain uninspired sameness to the ideas. Noodles and cheese played a big part in the effort, but the overall theme seemed to have been put together by a bored chef-wannabe who spent days, if not weeks, cleaning out his or her refrigerator of all the leftovers and attaching recipe labels to the mess. On the other hand, a walk through a grocery store some years ago, gave me access to someone's gifted culinary inspiration with those familiar ingredients...pasta and cheese. A magazine cover, which had been selectively hung in the produce section, caught my attention. Retailers know that shoppers tend to browse when they are looking and handling fruit and vegetables and they also know that the shoppers are not in as big a hurry at the beginning of their shopping trip where all those bins of fresh foods are colorfully displayed. That psychology worked on me and I picked up the magazine.The title of the issue screamed - ITALIAN, MAMA MIA!...Mile High Lasagna Pie...it was a Better Homes and Gardens Special Interest publication...back by popular demand, second printing. A picture of the pie mesmerized me...I turned the pages. Inside, a sidebar said, "With food you can...communicate affection, love and caring..."
I wanted to communicate affection and love... and I also couldn't wait to taste all those flavors I saw in the photograph of that lasagna pie. Of course, I bought the magazine and all the ingredients in the featured recipe...I was not disappointed...the final product was beautiful to behold and the first bite was more than I hoped for...this is a meatless meal and the flavors are wonderful together. Note: since posting this recipe, I have made another lasagna pie and changed the filling so it would be easier to use...tasted the same...looked great...see changes and pix below first posting. Cook noodles according to directions. Drain and rinse with cold water. Drain. Set aside. In a large skillet, heat 1 T olive oil over med. heat. Add carrot, zucchini and HALF the garlic. Cook and stir about 8 min. until tender. Transfer vegetables to a bowl. Add the remaining oil to the same skillet; heat over medium-high heat. Add mushrooms and remaining garlic. Cook and stir about 5 minutes or until tender. Gradually add spinach. Cook and stir 1 to 2 minutes or until the spinach is wilted. Remove with a slotted spoon to another bowl; stir in basil. Set aside. Combine egg, cottage and Parmesan cheeses, salt and pepper. Set aside. To assemble pie, in the bottom of a 9x3 inch springform pan, spread ½ C of pasta sauce. Arrange 3 to 4 cooked noodles over sauce; trim and overlap as necessary to cover sauce with one layer. Top with HALF the spinach-mushroom mixture. Spoon half of cottage cheese mixture over spinach mixture. Top with another layer of noodles. Spread with half of remaining pasta sauce. Top with all of the zucchini/carrot mixture. Sprinkle with HALF of the mozzarella cheese. Top with another layer of noodles. Layer with remaining spinach/mushroom mixture and the remaining cottage cheese mixture. Top with another layer of noodles and remaining sauce. Gently press down pie with the back of a spatula. Place pan on a foil-lined baking sheet. Bake in a preheated oven for 60 min. or until heated through, topping with remaining mozzarella cheese for the last 15 minutes or baking. Cover and let stand on a wire rack for 15 minutes before serving. Carefully remove sides of pan. Serves 10. Note: I do think this dish could be made ahead and refrigerated. Allow for extra time to cook if refrigerated. Change in filling: I cooked the carrot and zucchini and 2 cloves of crushed garlic until vegetables were tender. Next, I sauteed the mushrooms and remaining garlic until almost done and then, added the spinach...when the spinach was wilted, I chopped it up and added the carrot mixture back...mixed all vegetables well and added basil. Divide filling into thirds and add to layers as indicated. 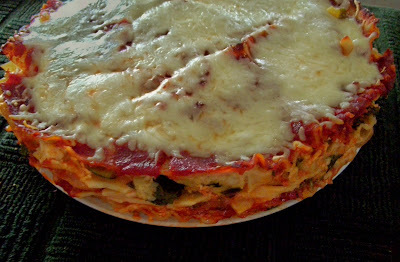 Actually, there are 13 layers not counting the mozzarella on top...vegetables are layers 3,7 and 10. Hope this helps get your pie off the runway! (Picture above shows that it turned out beautifully). Food Memories. Mile High Lasagna Pie. This Lasagna is one of my absolute favorites in your food memory blog, Diane! It is delicious and the best part -- it's vegetarian! Kenda wrote: This is one of my favorites of your recipes.